Finally! After so many months of procrastination I managed to finish this tutorial and share it. A few of you were begging to hurry up and post this tutorial already, sorry about the delay ladies. Any size baby food jar (empty and clean of course. I like the tiny ones), glue gun, thread and needle, poly fill (that is how is called, right?) or fluffy pillow stuff, a piece of fabric cut in a 5" diameter circle and some ribbon (enough to cover around the jar lid). Make a knot at the end of your thread and needle so it does not come off the fabric. 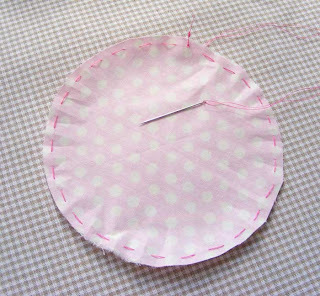 Take needle and tread and sew around your fabric circle over the edge, DO NOT finish off. Use a simple stitch because you will be pulling the thread to close the circle. While you do this your glue gun should be getting hot and ready to use. Place the handful of fluffy pillow stuffing in the middle of your fabric and gather by pulling your thread with the needle. 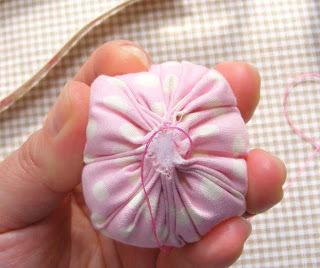 Use you hand to squish the fabric and stuffing to give it some shape and to continue sewing around. Secure with a knot, and finish off. 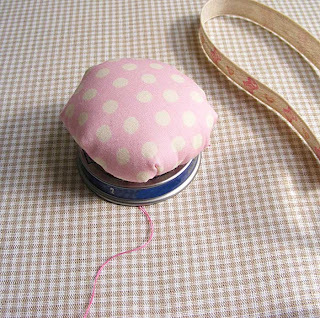 Cut your thread and the top of your pincushion should look like this. 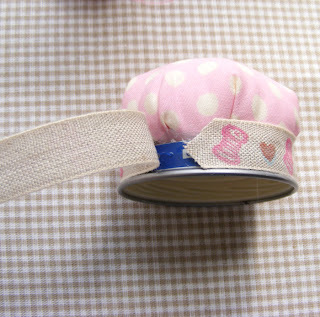 This is how you will place the pincushion over the jar lid (please ignore that pink thread coming out from under the lid). 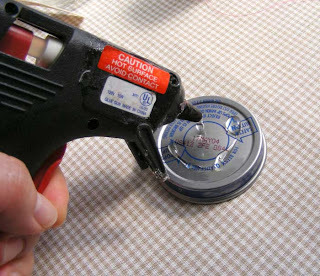 Immediately after you put some glue on your lid, place the pincushion on top (stitched part down)and press firmly to glue it to the lid. 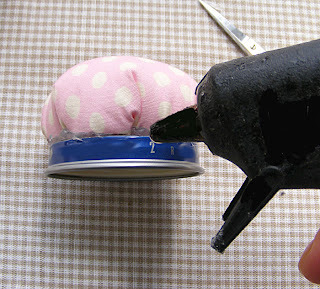 Keep pressing until the hot glue has cooled down and the pincushion stays on there neatly. 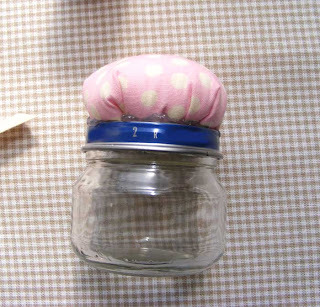 This is how the jar and lid should look after gluing the pincushion part. 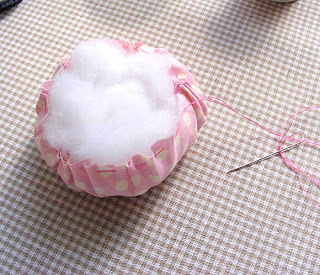 To conceal the messy part of the pincushion and lid, we are going to glue some ribbon around the lid. 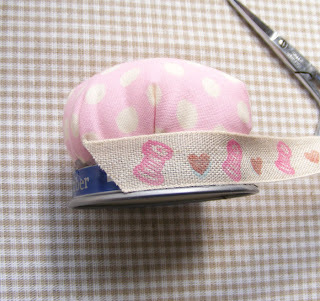 Use a wide enough ribbon so it covers part of the lid and part of the pincushion edge too. Work this part little by little to make a neat finish and be careful with the hot glue. Glue all the way around the lid, secure and cut the excess ribbon. I hope you enjoy this tutorial. If you have any questions or there are some typing mistakes, please let me know. omg, i love it!! the ribbon you used is so adorable! i might have to make one of these! clever - now i know what to do with all to with all those little jars i have stashed in my pantry! Just so stinkin' cute!! I wish I had kept some baby food jars...my littlest one hasn't had jar food in years and years though...sigh. (Sad, on both accounts, the fact that he is so big, and that I don't have jars!) Great tutorial! I knew I was saving my baby food jars for something. This is so cute. Thanks for putting the tutorial together. I just got my ballerina stamp and LOVE it. Woah that is crazy cute!! Thanks so much for this tutorial!! Thanks for this - this is definitely the next craft project for my two children - they have each have a tray of 'sewing' work in progress, with lots of loose pins on it, so they will love this! adorable.. love the ribbon its very sweet. Thats so great! Thank you so much for this turtorial!!! That looks so much more involved than I would have thought! Great tutorial, thanks! What a great and easy tutorial!Thank so much! what a fab idea and a lovely pin cushion thank you so much for the tute!! This is the most wonderful thing I've see all day. Thanks! Great way to repurpose! I've thrown away more of those jars than I care to count! Feel free to share a tutorial at Make & Tell Monday! Here's the link to this week's post. Jump in every week if you like! I love your blog so I've given you an award! It is the 3rd entry on my blog. Very nice! and it seems so easy to do! Love this! I have a ton of jars on my desk from my 6 month old. Now I know what to do with them all. I just LOVE this idea!! And your tutorial is perfect! Can´t wait to do one for myself!! Thank you for this tutorial. I just happen to have a little grandson who may be able to share some of his jars with grandma - yay! Honestly the cutest thing I've seen in a while. Thanks for sharing! 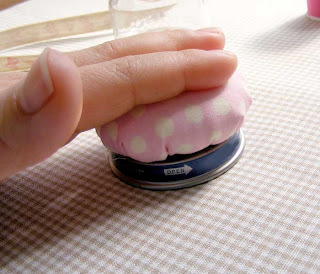 Super cute and extra handy...I have been wanting to make a pin cushion and saw this on Whip Up today! ! ! I am posting it on twitter...and will blog it too after I make one. I came via Sparklethot's blog. Thank you for sharing such a useful craft! And your glue gun def looks better than mine. hahaha. Complimenti il tuo tutorial è davvero molto bello. Ho fatto un post nel mio blog proprio su di lui. So cute! I will be using this for sure! thank you for a great tutorial! here is what i made. still needs to improve but i like the result. That is so cute!! I just had a baby last month and when she starts chowing on baby food, I know what I am doing with the jars! Thanks for a great tutorial! Aww! This is so cute! I would love to photo link to it if you didn't mind. EEEEEEK!!! I am SO doing that!!! I have a zillion jars, so I know that these will make great gifts too. SO adorable, and now I have a reason to showcase my vintage buttons. Thanks so much! Very cute! fiber fill also tends to dull needles so I go the hardware store and get steel wool pads and use those to stuff it with some fiber fill in the center to round it out. It does keep them sharp. I did this exact how to on cut out and keep a while ago and on craftster. your pictures are cute though..
Just wanted to let you know that I blogged about your tutorial today, I hope you don't mind. Thanks again! Oh my, this is so wonderful, thank you so much for sharing! I will try it out immediately when I get home tonight! What a great idea!! The jar is adorable! Thanks a lot for the tutorial. I will try to do it at home, for sure. Lovely blog and amazing crafts! Congratulations!! 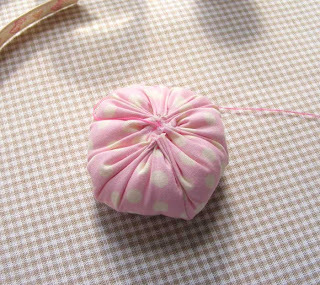 It´s the cutest pincushion I´ve ever seen!!! Thanks for the easy to understand tutorial!!! Adorable. I don't have a baby but I'm more than committed to the cause and will eat some stewed apples :o) Such a hardship!
! i made my own. Thanks for sharing this tutorial! this is so very very cute! i saw your blog on a Flickr! discussion and I'm glad I dropped by. hi thanks for the great tutorial i use it for a swap! tanks!!! I love your pincushion! Great tutorial! Thanks a lot for sharing! nice.. thanks for your tutorial..
hello, i loved your blog and your idea.I'll make one too for me. Love this tutorial! Will definitely be making one and posting on my blog. Thanks for sharing! I had such fun making these! I hope to put a pic of mine up on my blog and link to your tutorial. Thanks so much! Thank you for sharing your creativity to us. Wauw, thanks for this special tuterial of the pincushion! I will make myself such a beautiful cushion and I will put it on my blog with a link to yours. Lovely blog do you have! Thank you so much for this tutorial, it has been put to good use! I am going to go home and see if I still have any baby food jars to make them from, if not next time I go to the store I will be picking one up just for this project. My craft swap partner is in for a pincushioney surprise! Thanks! I made one of my own for a buddy of mine and I am linking to your site as well. Thanks! too dang cute! We have a 4 month old grandbaby and I was looking for simple craft ideas to use up all of those empty baby food jars! Fantastic idea! I´ve linked this tutorial in my blog. I just love your blog! Just the other week, I bought a small jar of baby food so that I could use the jar for some loose buttons. 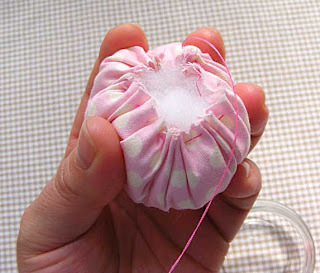 I was surfing the net for pincushions when I came across your tutorial. Now I know how to add to the jar and make it more funtional! They would make cute gifts too! Thanks for the tutorial! Merry Christmas! I can not wait to make this! Thank you so much for posting it! hi !!! those are adorable ! i love them ! do you have something is look like cupcakes , i have the jar but i would like to decorate like a cupcake , do you have any ideas or suggetions . thanks. That has to be right up there at the top of the list of the cutest things I ever saw! What a fabulous idea and a great way to recycle. I´m brazilian, I love your blog! This tutorial is amazing, thanks for posting it! I love your blog. this tutorial is adorable! Thank you so much for posting this! 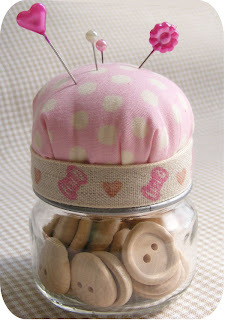 I was easily able to follow and make myself my own darling pincushion/button jar! 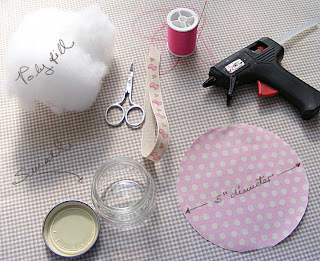 Love this tutorial - such a cute project. I made one for my niece who has just started to sew and she loved it. Thanks for the inspiration. Thanks so much! I linked to your site last night. How darn cute! I am going to have to make a few of these! Anyway, thanks for taking the time to make this tutorial! Deadly! Thanx a lot for sharing!!! Hi! Thanks a lot for this. I've made one and put a link to your page on my blog. Thank you what a great idea, you have inspired me to share some ideas I have and when complete I will send you a link. I am going to make several of these for all my fancy buttons!! I would be better if you would review my blog as well. Great tutorial - thank you!! The jar is just perfect to keep my zipper foot stored but handy! :-) Now I just need my hubby to finish up his business call in the home office so I can sneak in there and get some more glue sticks to glue the ribbon on. That's fun! Thanks for the tip! I used ours to take to school. I'm a college art teacher. The students loved them for Color and Design Theory! It wasn't as cute of an idea as yours, but as practical as your use. Thank you!! This is just what I was after and I've been making my own version - Christmas presents, I hope!! I just found this today, and I had to go out as soon as I found it to get stuffing to make one! for making this art is really grate and tutorial is also good.. This is a great idea. I put my own spin on it and just gathered the ends and tied with thread instead of sewing it. I also didn't have fabric or polyfil, so I used an old sheet of my daughter's and the polyfil from an old stuffed animal. I shared this on my blog today - thanks for the great idea! THANK YOU! This is DARLING! My scout troop is learning to sew and this is the perfect project for them! I love this idea. Thanks for sharing it. I linked it on my blog knitnatak.blogspot.com. This is such a great idea - Thank you! I'm just heating up my glue gun to do some sticking. I'm going to use the jar to stow the pins when I have to tote my sewing around.